Saturday May the 19th saw Northland Nightmares Roller Girlz’ first home bout of the season, an exhibition bout featuring Freakazoids in purple and pink (colours never usually to be seen in Solid Sarge’s derby wardrobe) versus Vomitrons in black and green. 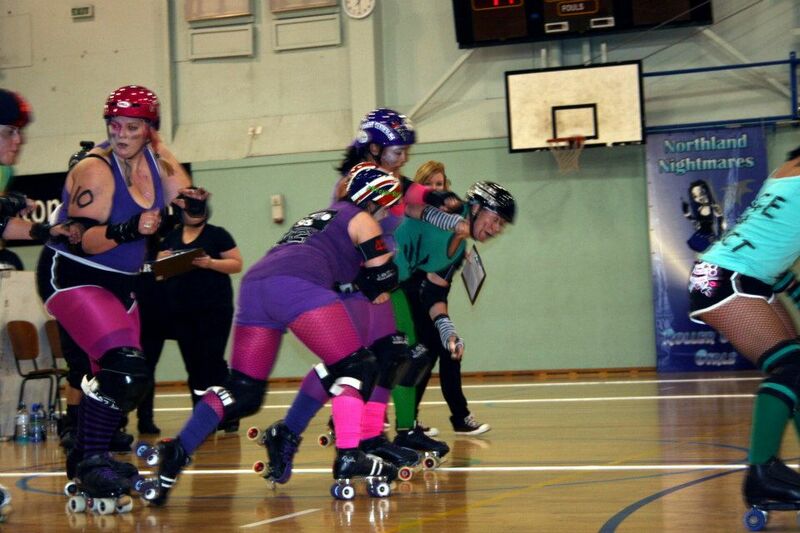 It was also the cherry-popping bout for Rage in Effect and Miss Rebelle, who, despite post-match nerves did awesomely! 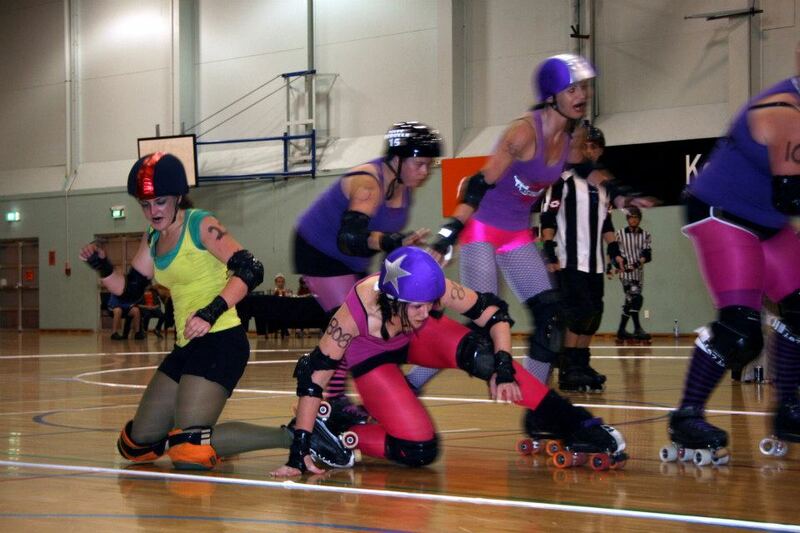 First up before the main event our amazing Northland Nightmare Derby Bratz played a curtain-opener game with Clobsters (in red, of course, ‘cos lobsters are red) versus Bruiser Cruisers (in purple, ‘cos bruisers are purple. 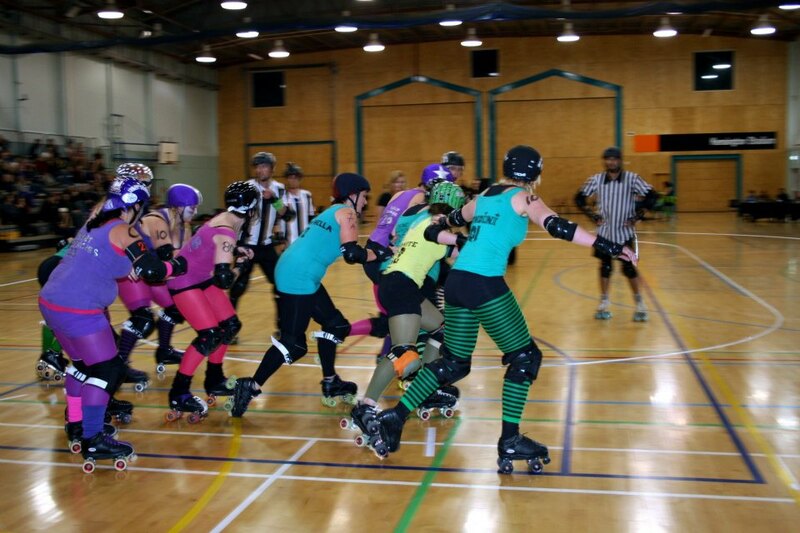 Most of the time anyway…) – it was a fantastic game and the Bratz played their derby hearts out with some excellent jams and blocks right till the very end. We have high hopes for our Bratz who are currently fundraising for a trip to Australia next year to get some game time against some other junior leagues as there are no others in New Zealand at the moment. You can help them out by buying stuff from their stall at games or buying a raffle ticket! 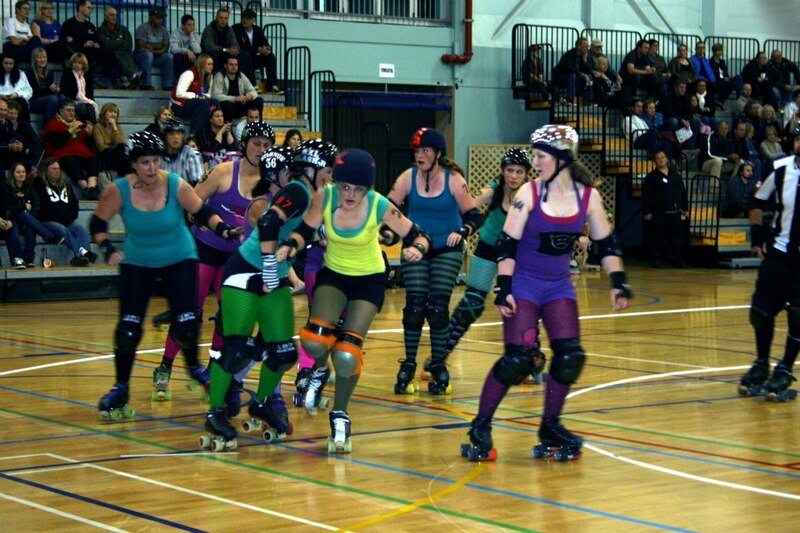 Bring on the big girls’ bout next, which was a tough, exciting match with captains (and sisters) Axl Slash-R and Violent Tendencies leading by example to bring the vocal 200-strong crowd some big hits and great jamming. It was great to see the improvement in the games of everybody, especially those in their second year of playing. 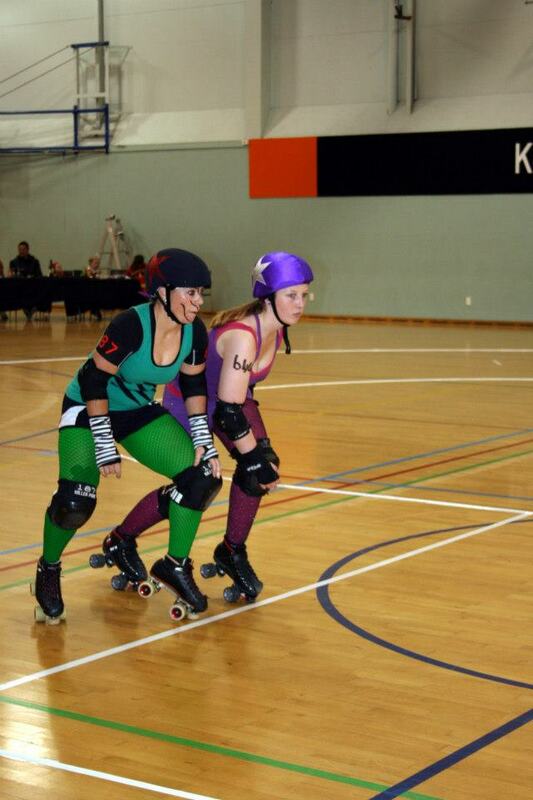 It just goes to show you can never stop improving your game when it comes to derby! It was also a top night for our support crew, with our NSO’s looking flash in their brand new sponsored t-shirts courtesy of Wards Music and some invaluable help from the guys and girls from People Potential. We were also able to have our own music instead of a DJ with our newly purchased sound system, and Taste of Hell now has her own wireless microphone to commentate the games and we now have VIP tables for our sponsors and special guests. 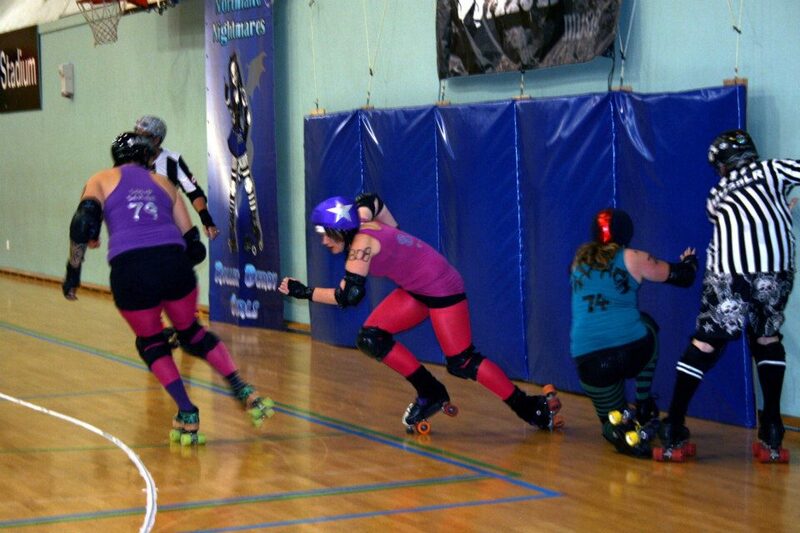 So DDIY (Derby-Do-It-Yourself)! Next game? 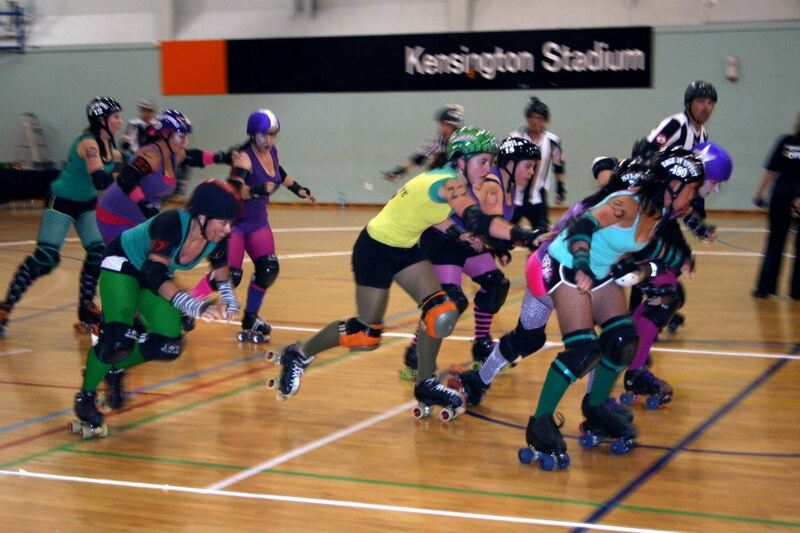 It’s a closed scrimmage with Auckland Roller Derby League which is going to be amaaaaaazing!!!! 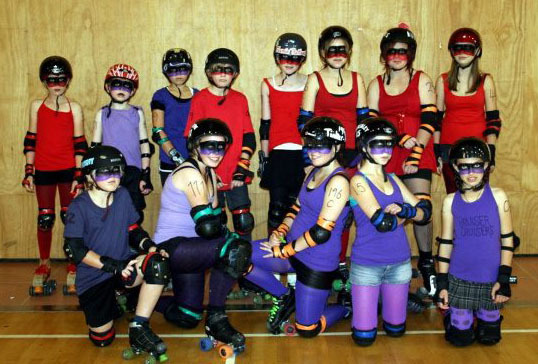 Next public game will be the first interleague bout of the season: Diva Destruction vs Deathrow Dolls on the 23rd of June. See ya there! This entry was posted on May 27, 2012 by nnderby. It was filed under EVENTS! .